Are you a parent of a preschooler, looking for your little one's very first game? Are you a parent of a kindergartener who becomes physically ill if she is about to lose? Are you a grandparent looking for a game for your grandchildren so that you can play with them without feeling either completely bored or completely lost? If so, I have good news for you but first let me say one little not-so-nice thing about preschool games. There are a few games for preschoolers that everyone gets and are considered "classics" but I really can't stand them! I won't name names but let's just say that these games involve a child getting a direction and then the child must do exactly and only that. The artwork is simple. The board and pieces feel sturdy and smooth. The colors are bright but not eye-blinking-bright. There is no thinking involved.. no choices to make. You might as well get a robot to play for you. Kids might like it but some are running away, screaming, crying "it's not fair!" And what about adults like me? Well, I just fall asleep. A player flips a card and must either feed the animal that he's uncovered or lay seeds for the animals to eat. 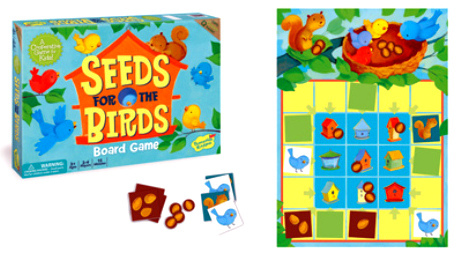 The object of the game is to feed more seeds to the baby birds than the squirrel. Honestly, this set-up is so different, I had a hard time understanding the directions - I think it is because I've never seen any preschool game like this before (but probably because I stink at reading directions). I literally had to take the game to Number 5's mom who is also a librarian and ask her to read the directions for me! But look, here is a video with instructions- just published this week. My video down further below will show you the sassier side of the game. 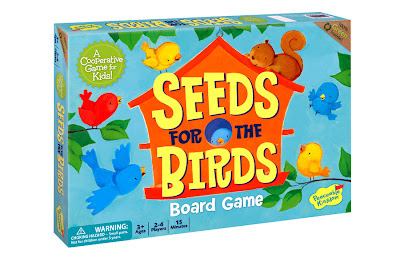 The storyline for Seeds for the Birds is easy to digest. The kids readily identify with the baby birds and the mama bird. They really want the family to win! Moreover, working together instead of working against each other, is a nature that I believe is more familiar to kids that age. This is the time when they are encouraged to take turns and share but right before this time, they have lived a life where they were being helped a lot. Basically, my guess is that they've been thinking more "me, me, me" or "me and Mom" but "me against you" is pretty foreign. The squirrel is cute too but we love feeding those birds. Also, consider this: Would you give a long chapter book to a preschooler? Even if he knew all the words, that would not be good. Why? Because things that drag out tire their brain. Whining will surely follow. They must get to the outcome fast. With my kindergartener, I have played Seeds for the Birds in under 7 minutes. But that doesn't mean our play is finished in 7 minutes. We just keep playing over and over again. I am leading a lot here but basically you can just present the choices that are available and let him see what happens. Lastly, it should be said that this game still speaks to the inner-competitor in all of us because your "team" can still "lose." Individual losers? Never. Losing as a team? Sometimes, but that is what makes it fun! And who is to say that a preschooler must have his first losing experience all alone? I dare say that all preschoolers could benefit by having their first losing moments as part of a team. Because the most painful part of losing is that awful lonely feeling. However, in a cooperative game like Seeds for the Birds, you are never alone. Kids end up processing more quickly that losing can hurt but only until they move on, will they get to feed the baby birds again. And feed those birds they will. 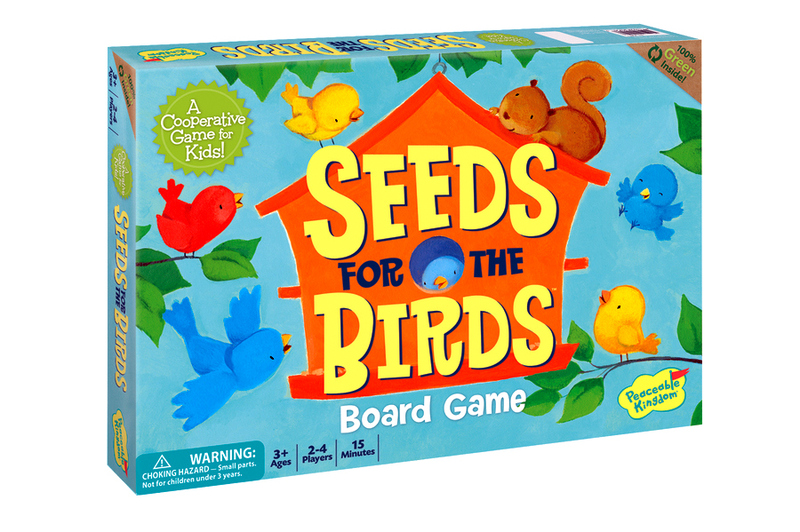 Now it's time to win your own game of SEEDS FOR THE BIRDS! This is a U.S. only giveaway and it ends on 1/3/13 12:01 AM. Remember to please follow the rules! Disclosure: Toys are Tools has not been compensated in any way by the manufacturer of this product. The product was given to the tester in order to facilitate a review. Reviews are never promised. I shop at Amazon and Toys R Us. The Wiggly spider game looks different. Does it come with extra webs for the kids to cut? I do my shopping on Amazon or our local toys tore, Sparkhouse Kids. I think my preschooler would like Stone Soup because he is familiar with the story. Feed the Woozle also looks fun because the graphics are fun. This year I bought most of my son's birthday and Christmas presents via Amazon, and also bought a super cool lock box truck from TAG Toys. And it looks like there are a lot of cool games at Peaceable Kingdom! I'd love to try them all! Feed the Woozle looks like something that my son might be really into eventually. Also, I'm never able to find your Amazon links on posts, by the way. I wonder if I'm just missing it, or if my browser's adblocker hides it from me. Would love to support the site whenever I decide to buy something! Wow, you must have one strong adblocker! There are amazon ads all over the site. Generally, as I understand it, if you go through any amazon link or ad on my site then whatever you put in your cart until you log out may send a small commission to me. If you really don't see one, you can use this link. http://www.amazon.com/?&tag=toyaretoo-20&linkCode=wsw& Feel free to bookmark it if you don't' mind the suggestion. I would love to able to keep this site going as long as possible. I remember Feed the Woozle was quite a move your body game. I loved that. don't buy much during the holiday season, but i like shopping in independent toy stores best. i like 'kidding around' in manhattan. Kidding Around has amazing stuff. A lot of the toys I've reviewed are sold there! We shop at Amazon or our local toy store. We are lucky in that we have two local toy stores within a 5 minute drive but we favor one over the other. saving them for when we can use them. We shopped at target and amazon mostly. One toy we ended up getting at toys r us because no other store had it (toy working vacuum). My favorite toy shopping spots are eBay and Larson's Toys in Columbus, OH. I like the Stone Soup Cooperative Game at Peaceable Kingdom. Looks like fun! Great, thanks! Yeah, I guess the adblocker really works! I'll try to use your link when I can, since I'm always shopping on Amazon. We shopped mostly through Timberdoodle, Christianbooks.com and Target this year. Stone Soup interests me b/c it has obvious book tie ins and we love books both for hoemschool and tutoring. We bought most of our gifts from Amazon. One gift we bought from our local hobby shop. A few stocking stuffers came from the $1 store. This is close to the same thing we did last year. I like Hoot Owl Hoot! Cooperative Board Game the best. One of my sons favorite games is Candyland so I know he would like this one too! I also like how this would teach my sons to work together.